Our Pre-K Second Edition Curriculum is now available for purchase, featuring updated lesson plans, additional products, more integrated math, science, health, creative arts, social studies, physical movement, early literacy, and social­-emotional development, all under a framework of guided instruction and imaginative play to create a more academically rewarding experience. Click here to learn more. Starfall helps ensure that all children have access to the Starfall Kindergarten ELA Curriculum by participating in the NIMAC repository. We submit files to the NIMAC which are then used by states to produce formats such as braille, large print, digital audio, and digital text, for students with qualifying print disabilities. For more information on how the NIMAC works, or how to obtain accessible materials for a student in your state, please contact the NIMAC at 877-526-4622 or nimac@aph.org for additional information. 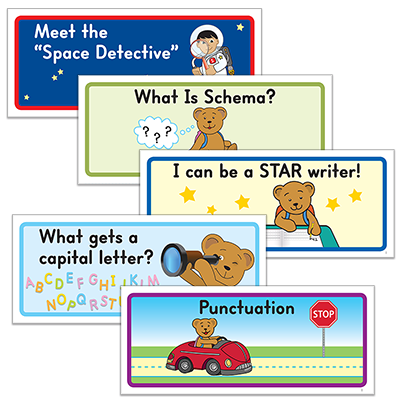 Starfall’s Kindergarten ELA Second Edition curriculum now includes anchor charts that cover capital letters, punctuation, schema, spacing, and writing! Anchor charts allow students to “anchor” their thinking to the charts to help them remember topics presented. Starfall’s anchor charts are an excellent way to guide your students’ thinking and emphasize important parts of your lessons. You can buy our anchor charts as part of our ELA curriculum, or you can buy just the anchor charts to use in your homeschool or classroom today! Not using our curriculum? You can still purchase all our curriculum kits at our Starfall Store - visit today for more information.